The USPTO has just published a patent application that Apple filed back in February, according to a story in SlashGear. 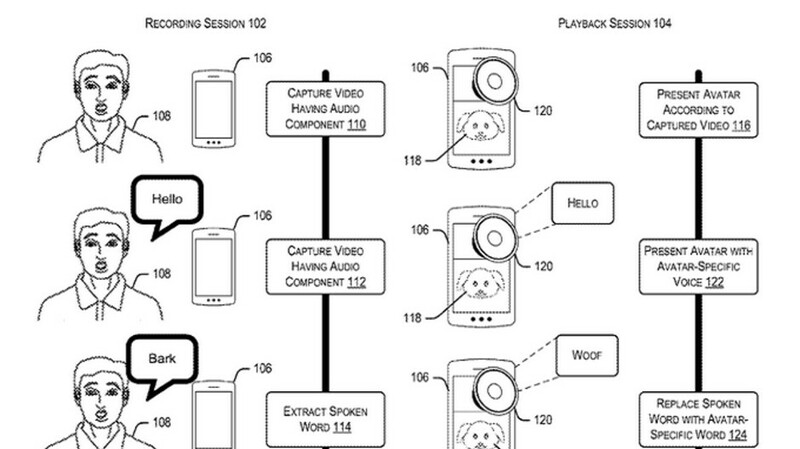 Titled Voice Effects Based on Facial Expressions, the patent relates to technology that would allow an iPhone user to bark while using the Animoji feature, and have a real dog bark come out of the speaker instead. That is but one of three different options shown in a diagram from the application (which you can view at the top of this article). Based on the diagram, one feature of the technology would capture video of the user's face and any audio, and the result would be played as a virtual avatar. Essentially, this is what Animoji are all about right now. In the second part of the diagram, the user's facial movements are captured on video along with audio. In this case, the screen would show the virtual avatar mimicking the facial movements with synced audio coming out of the speaker with a special effect related to the avatar. The third part of the diagram shows the user once again having his facial movements captured, but this time he says something from a list of pre-set options. In the example, the user barks like a dog. On the display, it shows the user's virtual avatar while the speaker plays real barks from a dog. The patent application also covers the possibility of the technology translating certain facial expressions made by the user, into words. We are never sure if a patent application, or even a newly granted patent, will end up being used in a future product. However, we can see that Apple is giving serious thought (after all, filing patents costs money) to the future of Animoji. kiko da Kellyanne Conway of PA, piyath, Venomxydanomercybiach, rouyal, marvshasfallen aka Peaceladyboy, midan, umaru-chan, Nate Diaz Lover & Leo da 'No display' iMultitasking MC: "iOMG!! Our iMighty has finally done it!! This is the iFuture!!" Victor H, Daniel P & Ray S: "This is iBig guys!! Now we'll just add additional 1.3 pt more to all Apple products. No one can't iDeny it now haha"
Is that you Ray S?! Here’s some attention you are begging for. You’re welcome. You do know about it better than anyone with all the iBS you post here everyday. What’s up with Animoji???? Some body tell me how is it change people life or useful in people daily? I found it is gimmick at best. What a joke. i thought the same thing, then got an iphone x. this is a cool treat for the kids when i facetime them to their ipad. I've also made a trump animoji with ios 12, and now making funny remarks in trumps voice in text messages... (sends a gif to android users).. you're right, it doesnt change people life, nothing since iphone OG has changed anything in that regards, some add usefulness, some things add fun. Curved edges on samsung phone add nothing usefull nor change poeples lifes either, for me it was an annoyance. so by your logic its a gimmick. using animoji is easy, has no issues, and is fun. Judging from you avatar, I think it's totally change your life. Yeah I made an aviatar from it, just to bug android freaks like you. It worked. I love android, I used Samsung for bigger half of my smartphone experience - and I will never be as ignorant and judgy as you. If it not useful for you it will be for others .. just stop judging things from one perspective. Actually the curved glass serves several purpose. Allows for a bigger phone, yet feels smaller. It adds to its look in making the phone look better. Animoji and AR-emoji arw both pointless gimmicky useless features. Devices are already filled with emojis that are rarely used. Yes I agree, something adds useful things, some for fun. Animoji was something Apple stole and still hasn't paid for like many other things they have. You need to patent this baloney?look where all the money is going. It's going nowhere but in Schiller and Cooks pocket. No innovation whatsoever. Just take audio of a barking dog and add it to the file that's made. This seems totally stupid. Haha. Kiddie toy phone features. Nothing with substance. No floating windows, no split screened multitasking, terrible battweylifw, no premium headphones, no fast and no adapters. But let's waste money to patent some BS.